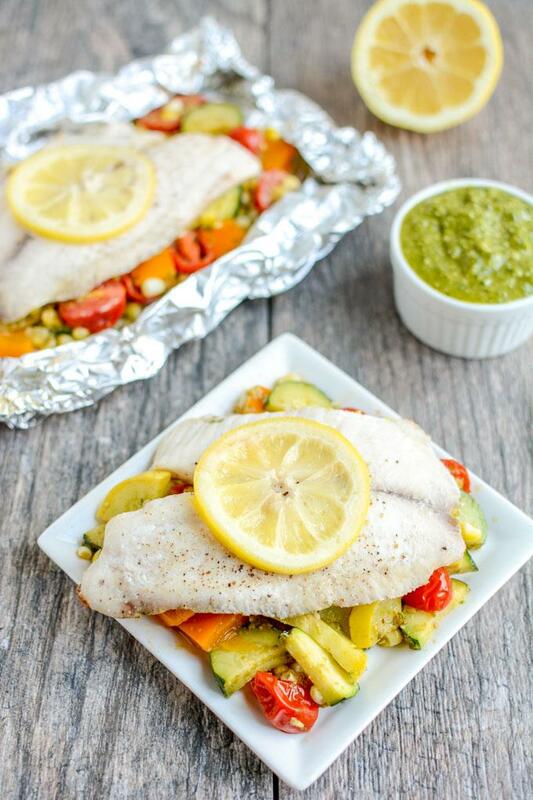 This recipe for Grilled Foil Packet Tilapia with Pesto Veggies is perfect for a summer dinner! It’s quick, easy and healthy, plus cleanup is a breeze! Some of you may remember that over the past year or so I’ve been teaming up with my friends at the National Fisheries Institute to share some recipes. So far I’ve introduced you to these Quick and Easy Seafood Recipes, this Sheet Pan Italian Salmon and Green Beans and these Easy Tuna Melts! Last year, they launched a seafood education initiative called Dish on Fish to help educate Americans about the importance of eating seafood and to encourage seafood consumption so be sure to follow them if you’re looking for easy ways to eat more seafood! Today we’re going to talk about grilling! Grilled seafood is the perfect option for summer. It cooks quickly, requires very little prep time and tastes absolutely delicious. If you’re scared about handling the grill, rest assured that these foil packets are so easy that even I can handle them on the grill by myself. Pretty much all you have to know how to do is turn it on! It’s been so long since I made a foil packet dinner and I forgot just how wonderful they are! Simple to put together, easy to cleanup and this particular one cooks in about 10 minutes. Triple win! 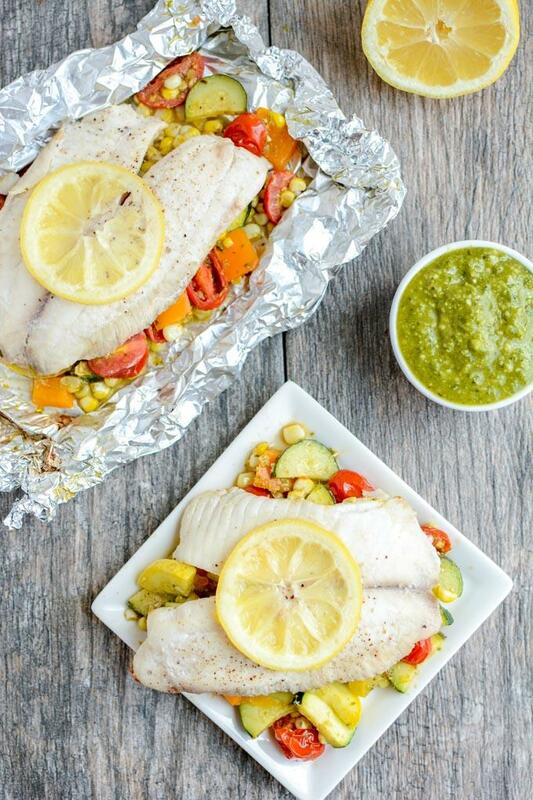 All you have to do is chop some veggies, toss them in pesto and scoop them onto foil. 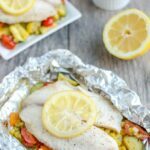 Top with tilapia, a simple white fish that cooks quickly, add salt and pepper and lemon, wrap them up and throw them on the grill! Preheat grill to medium (about 400 degrees). In a bowl, combine vegetables and pesto and stir until well coated. Divide vegetable mixture between 4 large sheets of foil. Top each pile of veggies with a piece of tilapia. Add a slice of lemon and sprinkle with salt and pepper. Fold sides of foil up to meet in the middle and fold closed, then fold in sides to seal foil packets. Add foil packets to grill and cook for approximately 10 minutes. 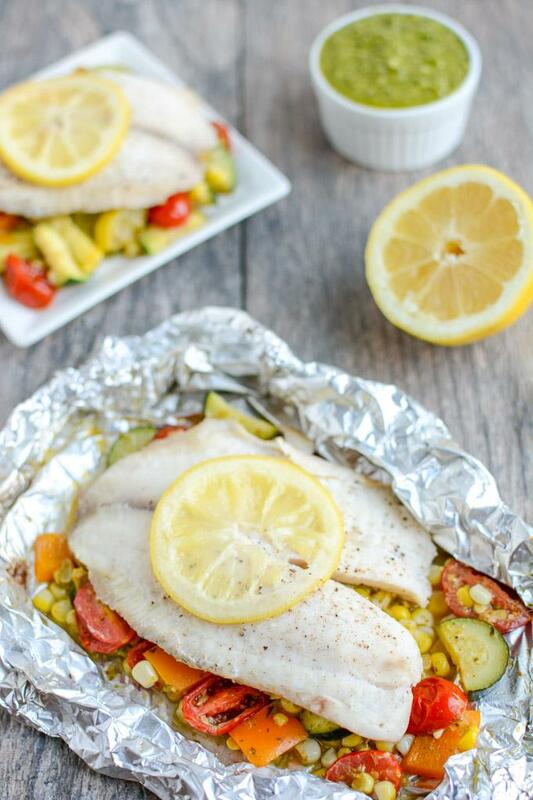 Tilapia is done when it is white instead of translucent and flakes easily with a fork. Drain excess liquid from packets before serving. You can use frozen tilapia but you’ll need to cook it a bit longer. Pretty simple right? This would also work with other white fish or salmon, you just might need to adjust your cooking time based on the thickness of the fish! You can serve these directly out of the foil packets or transfer to a plate. Feel free to customize with your favorite summer veggies – just make sure not to use something like potatoes which will take longer to cook. This is so easy! It’s been a long while since I’ve done foil packets not while camping lol. This reminds me that I should give it a try at home, too! Plus Pesto is awesome. This looks amazing with summer coming up! Yummy! I am just starting to eat fish and definitely prefer a lighter white fish right now. How many calories is each serving? Can you make these in the oven? yep! I would try around 400 degrees. Time should be about the same but you might want to check a little sooner.